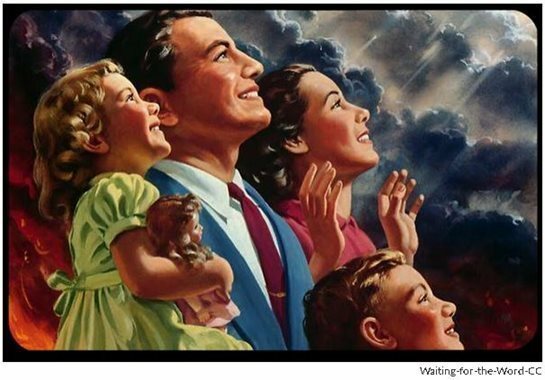 According to LaHaye and Jenkins, the true believers will be raptured up while billions of non- or questionable believers will be targets of a God gone madder than Dirty Harry. In 2004, when Americans by the millions were reading the Left Behind novels and buying into the “Rapture” theology of authors Tim LaHaye and Jerry B. Jenkins, the two authors had an interview with the late, great Morley Safer. Sadly, millions of American evangelical Christians in 2016 still embrace this image of Jesus as a Dirty Harry figure who will slaughter your own non-believing loved ones if they happen to be non-believers. It’s no wonder so many Rapture-believing Christians see nothing wrong with torturing enemies or meting out the death penalty even if it means a “few innocent people” get sent home to God by the State. Honestly, I have to wonder if Jenkins and LaHaye have ever read the Sermon on the Mount with its Beatitudes. Jesus does have his judgmental side for sure. It was out of fiery, righteous indignation that he cracked the whip on some money-grubbers (speaking got the fabulously wealthy Left Behind authors) in the temple. But–contrary to what so many Christians who don’t study the Bible think–he didn’t physically assault anybody with the whip. Jesus spoke in harsh judgment in a series of “woes” to the hypocrites who incensed him–the scribes and Pharisees who judged him to be a threat to their comfortable power and control over poor and vulnerable people. And here’s another point lost on the co-authors of the Left Behind books: Jesus looks down from the cross on us all in judgment every day. That’s part of the theology of the cross–the vantage point from where Christ asked his Father to forgive his persecutors. I suppose the Christ who sought such radical forgiveness from the cross could be construed as the “loving, wimpy” Christ of some kind of “liberalism” that Jenkins and LaHaye fear in all their extreme conservatism. There’s a possibility, perhaps, that when he looks down in judgment on Jenkins and LaHaye, Jesus weeps over how the authors have distorted the image of he who was the incarnation of love. “The biblical stuff is as close to the Bible interpretation as we can get. But if they (readers) are not people who read the Bible, they don’t know which is which. In fact, biblical scholars say the Left Behind authors have invented a violent Jesus because they’ve invent a violent Jesus. UNLESS you take John’s vision literally, which obviously is now how it was supposed to be taken. What kind of monster of a God would literally melt the eyes of even some enemy? Quite to the contrary, Revelation contains two beautiful scriptures in which God wipes away the tears from the eyes of God’s people (see Revelation 7:17 and 21:4). It cannot be said enough that Revelation and books like Daniel were not written as prophecies in which prophets looked into a mystical crystal ball and told us through scripture how the world will be blown up by an avenging Jesus who, in his unjust judgment, will be the Jesus of holy massacres. It cannot be said enough that Revelation was a pastoral letter written in highly symbolic–not literal–apocalyptic language. As I’ve noted often in this series, just because the symbolism, images and metaphors John used are difficult wrap around our heads around doesn’t mean it was difficult for readers in the year 90. It’s a shame that Jenkins and LaHaye–and TV preaching hucksters like John Hagee in San Antonio (who has enormous political clout in American politics these days) continue to rake in millions of dollars annually pushing a monstrous Christian theology that has no scriptural legs to stand on. Is God a judge? Absolutely. Is God a fair, merciful and just judge or a God waiting to go all Dirty Harry on the ever sin-sick world which is so in need of God’s loving, healing powers? Read the Good News of Jesus Christ, the Good News of extravagant love, grace and mercy, and then, you be the judge.